This slot game from Novomatic brings a totally new concept to the meaning of the word ‘slot’! Slot games usually all work the same way. Once you’ve played one – you’ve played them all! Well, that’s not quite true, since slot games are usually based on unique themes and have unique symbols! In any case, no matter how the slot game appears, the rules are normally similar. When you sit down at a slot machine (or you open up an online slot), you set your bet per spin. Then you spin the reels and hope for the best! Each slot has a set of symbols that are unique to that slot and some symbols are more valuable than others. On average, each slot game has between 5 and 10 unique symbols. Slot machines give payouts when you match up symbols on paylines. Unless the slot has Scatter pays, for example, you’ll need the matching symbols to fall adjacently from one side of the reels towards the other! Most slot games made by Novomatic have paylines that pay from left to right, meaning that you’ll need to keep an eye on the first few reels! Mega Chance, however, is a totally new ball game – or slot game, should we say. Novomatic’s Mega Chance only has two symbols in the whole game! They’re both fruits as well. You’ll only be seeing oranges and watermelons in Mega Chance. When you first spin the reels, you might be tricked into thinking you won a huge payout but you’ll need to get used to the rules before you start celebrating. Luckily, Mega Chance is still Novomatic at heart and they have a paytable where you can see all of the rules. You can play Mega Chance automatically using autoplay and you can gamble your wins, too. 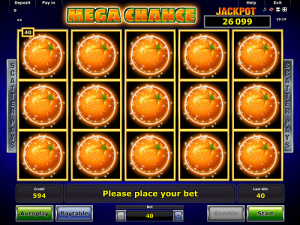 In addition to its unique payouts and slot rules, Mega Chance has a big jackpot! In Novomatic’s Mega Chance, the watermelon is much more valuable than the orange. You won’t really want to see the orange showing up on your screen unless it fills the whole thing! That’s because the orange only gives one payout and that for x15 matching symbols. So, for the orange to give you any money, you have to spin the reels and land the orange on every position of every reel! Even when you manage to spin x15 oranges, you’ll only get a win the same size of your bet. On the other hand, watermelons are very valuable. In comparison, you only need to spin x5 watermelon symbols (in any position) in order to get the same win as x15 oranges. When you spin x6 watermelon symbols, you’ll get double that (so twice your bet)! The wins for the watermelons keep getting larger. 9x watermelons, for example, will give you 10x your bet and 14x watermelons will give you 100x your bet! Then, x15 watermelon symbols will award you the Mega Chance jackpot! You might be lucky enough to spin this randomly by covering every position of every reel in just one spin. Otherwise, you stand a better chance of winning this with the Free Spin feature. Every time you spin x7 or more watermelons, they will stay in place and the slot will award you a Free Spin. If, during the Free Spin, one or more watermelon symbols land anywhere, where there was previously an orange symbol, these will also stay in place and the game will award you another Free Spin! This will keep on happening until either you spin no more watermelons (oranges keep landing again on the free positions) or until you fill the entire set of reels with watermelons! This is when you’ll be awarded the huge Mega Chance jackpot!